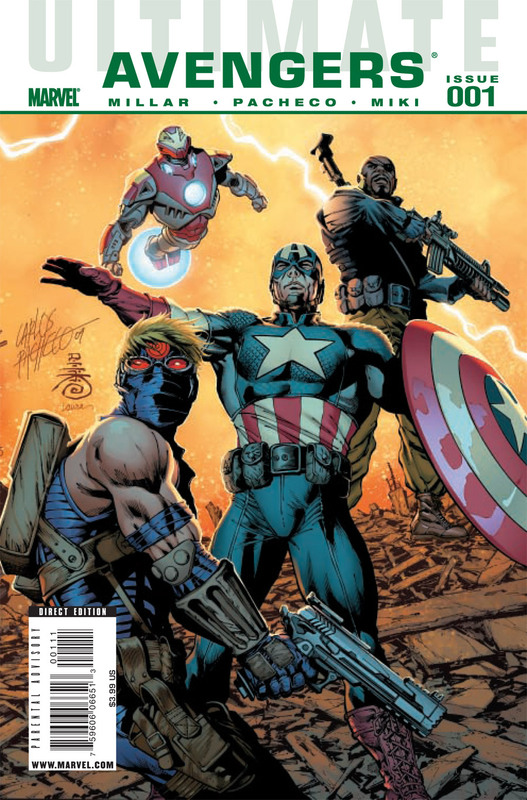 Mark Millar and Carlos Pacheco kick off the rebooted Ultimate Universe with a lot of style – this is essentially one big action scene, with a nice twist at the end, and the result of all of it is that Nick Fury is back in the fold and Captain America goes AWOL. Hawkeye is the star of the show, dealing with terrorists (including the Red Skull – re imagined for the 21st century and looking better for it) and saving a superheroes life in one issue. The art (courtesy of Carlos Pacheco) is lovely, lovely, lovely – your eyes dart from panel to panel with the exhilaration of watching a great movie action scene. Saying that, the whole experience of reading Ultimate Comics Avengers #1 is over in about 5 minutes, but it is a highly enjoyable few minutes. There is little hand-wringing or soul searching following the end if Ultimatum (this issue takes place 3 weeks after the end of Ultimatum #5), and that is a good thing – this new Avengers title seems fresh and full of life, so much more welcome than the nihilistic, petty Ultimatum title. I think the Ultimate Universe could benefit from the slimmed down title roster, and if the quality of Avengers is maintained, I believe Ultimatum may be forgotten (though probably not forgiven).